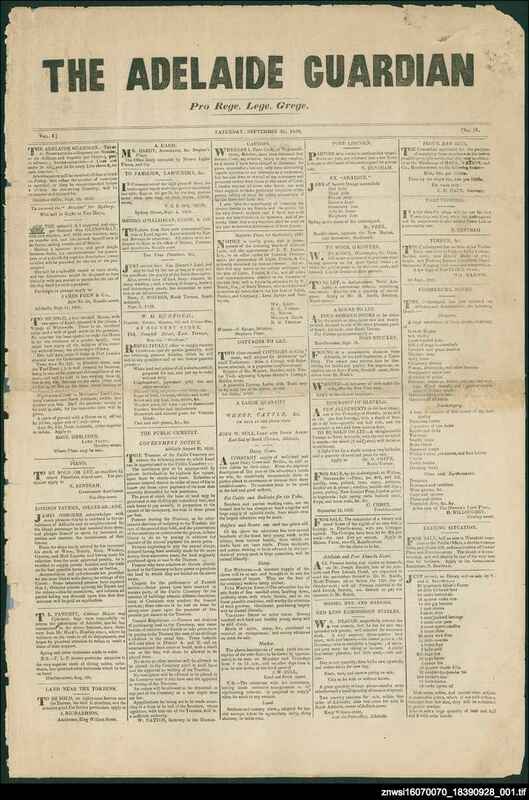 The Adelaide guardian was printed by William Caddy Cox, later the first South Australian Government Printer, for George Milner Stephen, one time Advocate General, Acting Governor and Crown Solicitor of South Australia. Stephen's main aim was to justify his own controversial activities, particularly over the apparent false advertising of his subdivision, the 'Milner Estate' at Port Gawler. In November 1839, when he was charged with perjury Stephen sold the copyright and equipment to his partner, with Oliver K. Richardson becoming editor. Stephen followed Governor Hindmarsh and his family to England and then Heligoland, and married Mary Hindmarsh. Early events such as the gathering of funds for a memorial to Colonel Light, and the establishment of the first Adelaide Hospital are mentioned, as well as a seemingly high number of drownings in the River Torrens. Robert Thomas of the Register later purchased the title, re-naming it the Adelaide Chronicle with J.F.Bennett becoming editor. The newspaper did not survive the economic crisis of 1841-1842. The newspaper was issued weekly, on Wednesdays. The State Library holds copies of only two issues of this historic newspaper, and a photo-copy of a third issue, the original of which is held in the British Museum, London.